The recently revamped Miyajima Aquarium (Suizo-kan) is a family-friendly activity for anyone visiting Miyajima island. Originally built in the 1980’s, it has been rebuilt on the same location, but has been completely remodeled. The new version of Hiroshima’s only aquarium re-opened its doors in the summer of 2011. The aquarium isn’t as big as the most famous in Japan, but it has an impressive 13,000 creatures of 350 distinct varieties which are found in Hiroshima’s surrounding Seto-inland sea. There are also some popular creatures imported from abroad including penguins, sea lions and otters which are also on display. The most popular attractions at the aquarium are the shows with the penguins and sea lions which are held a few times each day. Feeding times are also a popular spectacle as the divers enter the big tanks to feed the fish, manta ray, eels, turtles and sharks. Penguin feedings in their enclosure are also popular “shutter chance” opportunities. The Otters are a popular display to watch at anytime as they are always entertaining- frantically repeating their swimming and climbing routines. The “finless” dolphins are one of the most popular attractions and seem very interested in us as they will come up to the glass and look directly at you. 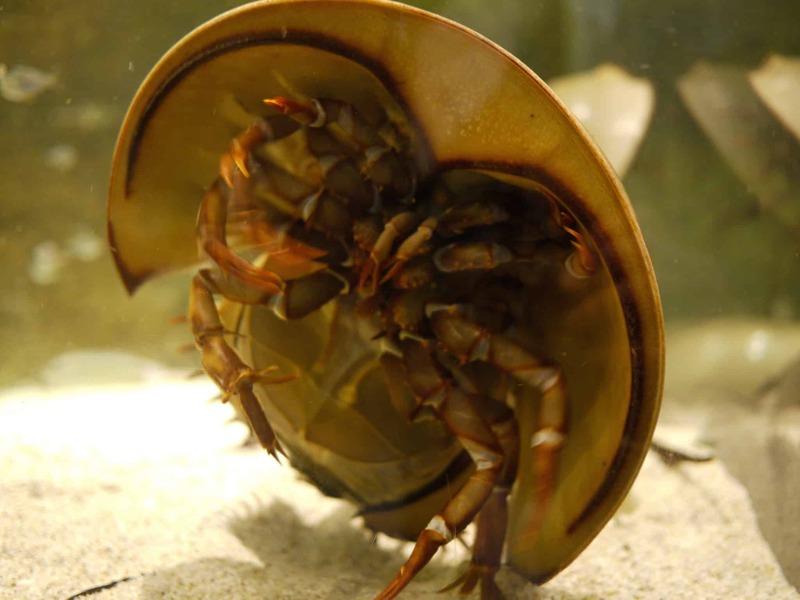 Upon entering, there is a special area dedicated to the bizarre “kabuto-gani“ horse-shoe crabs which have lived in the Japanese waters and migrated to the shores along the Seto Inland Sea for over 400 million years. They are considered by experts to be living fossils as they have not changed in shape, size or lifestyle habit throughout evolution. On the first floor, there is a tide pool area where children are encouraged to touch and pick up some of the harmless sea creatures on display. Starfish, sea cucumbers, seaweed of many different types and more are fun for kids to interact with there. Other activities include looking through looking glasses at the small pool just after entering and of course watching one of the live shows offers interactive opportunities for some lucky people in the audience (sit in the front middle row if you want to interact with the sea lions). There is also a special event room next to the big tanks which changes every few months. When we went last year, there was a “magic pictures” exhibit where you could stand next to 3-D style paintings of sea creatures and look like they were interacting with you. In the new year, there is a special exhibit for sea-horses as they are called “Sea-Dragons” in Japanese and 2012 is the year of the Dragon. On the Miyajima Aquarium website, they have some great short videos of the creatures in action at the aquarium as well as updated information on new creatures, prices and special events. There is limited information in English (price and entry details) on the website and there are not any full time staff who speak English, but there is some information inside in English explaining about the creatures on display. There is a small cafeteria offering standard Japanese family restaurant type foods (Japanese noodles and rice dishes). The toilets are both Japanese and Western style and there are diaper changing facilities, it also is “barrier free” meaning it has wheelchair access.